Whenever I see boardwalks like that.. and I grew up around many of them.. I think SPLINTERS..lol.. I love places like that, where the kids can explore, learn fun things, and get to be KIDS. looks like a great time. We went once with my sister. Beautiful beaches. So good to see you! I really LOVE these pictures! I had not seen or known about the tallest man. And the dizzy room picture is awesome and psychedelic. It is a perfect picture of weirdness and fun. 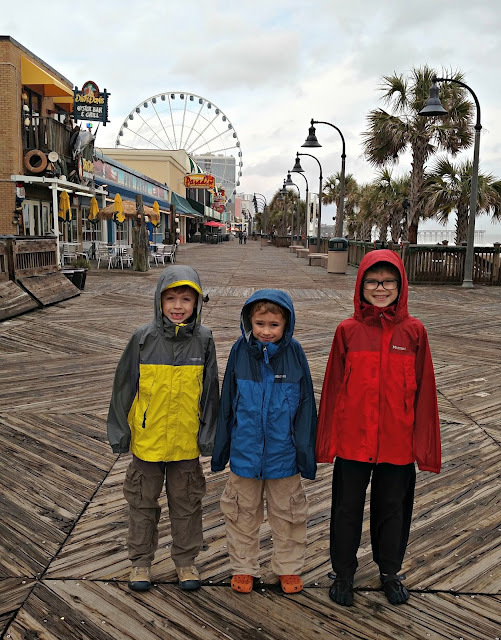 I love the boys in their raincoats; I can see there are almost no people there! I hope you will be showing us what you will be planting. How fun! We have Ripley's here but has not heard of the other one. Look at Pierce so tiny next to that wax figure. You a Paul find the best places to go for the boys that you both enjoy as well. How fun! I had a roommate in grad school that talked about Myrtle Beach a lot. She loved it there. I've never been. 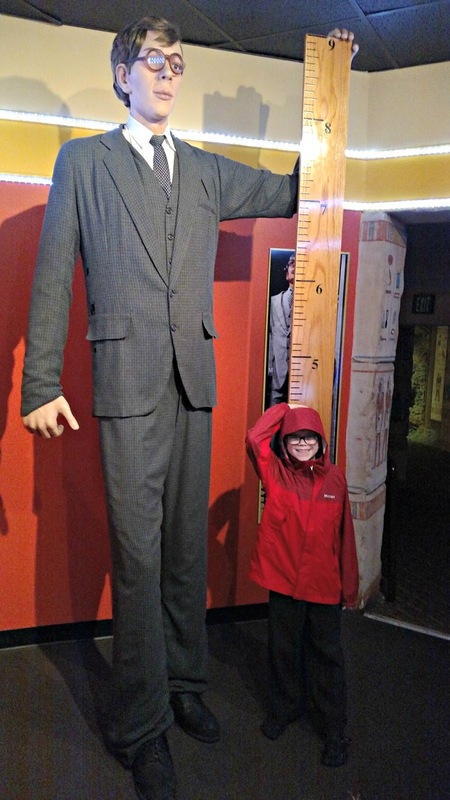 The Ripley's Believe it or Not museums are fun! We went to one in Wisconsin Dells. They had one of those hallways at Universal Studios for Halloween Horror Nights, but they did it completely with 3D glasses. You seriously were falling over by the time you got to the end, even though nothing was moving. looks like your boys had a blast! so cute! Wow, that is some tall man! Glad you had a nice getaway. My parents live in the Gulf and a trip during the off months is always a treat. No crowds! Looks like you guys had a fun time despite the rain. What a great time,, and wonderful photos! That's funny about the air/jump. 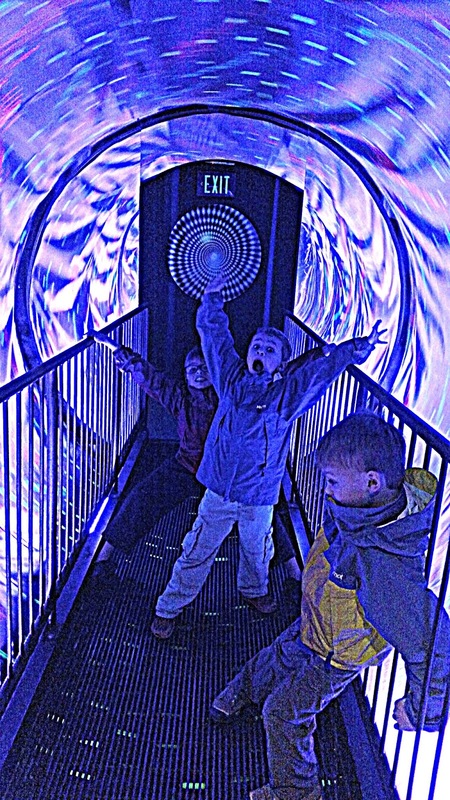 :) I bet my kids would like that optical room too. That's an awesome pic you got in there...and the first picture is rocking great too! Glad you had fun. The boys were surely having fun! We haven't visited the Ripley's museum here in NYC..
You picked the right time to go to the beach. My wife and I lived on the beach in Emerald Isle, one of the outer banks islands, for a year. In the summer it was nice, but crowded. In the winter, not a soul stayed out there but us. I had the beach and the pier all to myself. Used to drink my coffee out on the pier virtually every morning as the sun came up over the ocean. What a fun little get away and at the right time too; no crowds!!! Boy, that tall man was reallllllly tall! That looks like fun! What an awesome tunnel! So fun... I have to go! We would love the Odditorium! Is that wax figure the true size of the largest man in the world? Oh my! !